The current policy directions issued to the Fund were introduced in 2012 and the Office for Civil Society is now consulting on new ones. In our response we argue that many of the proposed directions far too closely align the Fund to government policy priorities greatly undermining the principle of additionality of the Fund. 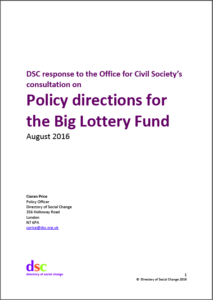 The Big Lottery Fund is a grant-making body established by law, which is independent of government policy however must comply with policy directions. These are described as ‘matters which must be taken into account in determining the persons to whom, the purposes for which and the conditions subject to which the Fund distributes money’. These directions are set by ministers. The proposed policy directions can be found here.